FITE is proud to announce that Uncharted Territory - Beyond Wrestling's brand new weekly shows, will air live on FITE and IWTV at 8pm ET two weeks from now. Every Wednesday night there will be a new show live from Worcester, Massachusetts accessible to fans worldwide. The wide range of platforms that will carry the weekly shows will allow fans to tune in every week no matter where they are. Each episode of Uncharted Territory will be available at a PPV price of $9.99. A Season Pass will be available for $149.99 which will include the first 18 shows. Individual tickets for entry to the inaugural show have been sold out but some season tickets are still available here. Sold out shows can still be viewed as PPVs on FITE and IWTV. WrestleMania week will begin with the 4/3 show, available on FITE TV and IWTV. 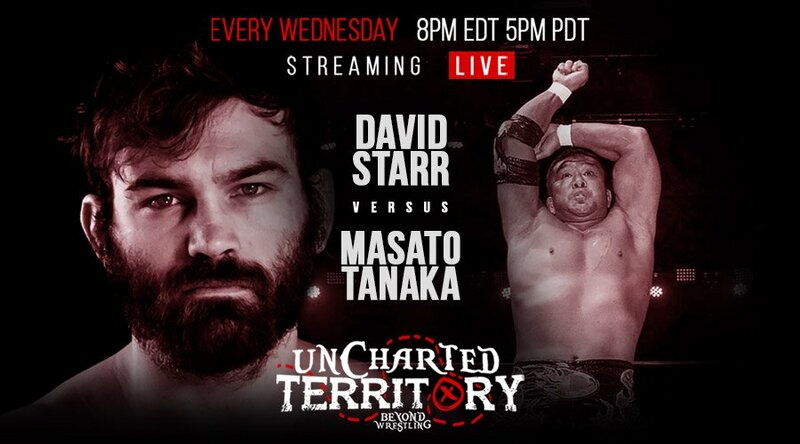 It will feature former ECW Champion Masato Tanaka debuting against David Starr. The line-up also includes AEW's SoCal Uncensored (Christopher Daniels, Frankie Kazarian and Scorpio Sky) versus Team Pazuzu (Chris Dickinson and LAX).